Hope you are enjoying your weekend. Just a quick blog post to show you my ADAM photo for January, theme was light. I bought a ton of clothes for my momokos last year (In march I believe!! ), hope this ADAM thing gives me a good excuse to show them all. Adorable fashion blogger! And with a nice name too 😀 I am glad that you are taking this challenge – ADAM. Look forward to seeing the following months. The best name!!! Thank you! She looks cool. And I’m very curious about other clothes. Hope I’ll stick to this long enough to show them all lol. Thanks! She looks really pretty, I love that style!! And I love the hair xD is this her default hair or did you gave her this amazing Afro? It’s her default hair! There’s other releases of the same face with other hair types, but I only had eyes for this one, it is fabulous, thanks! Thank you so much!!! 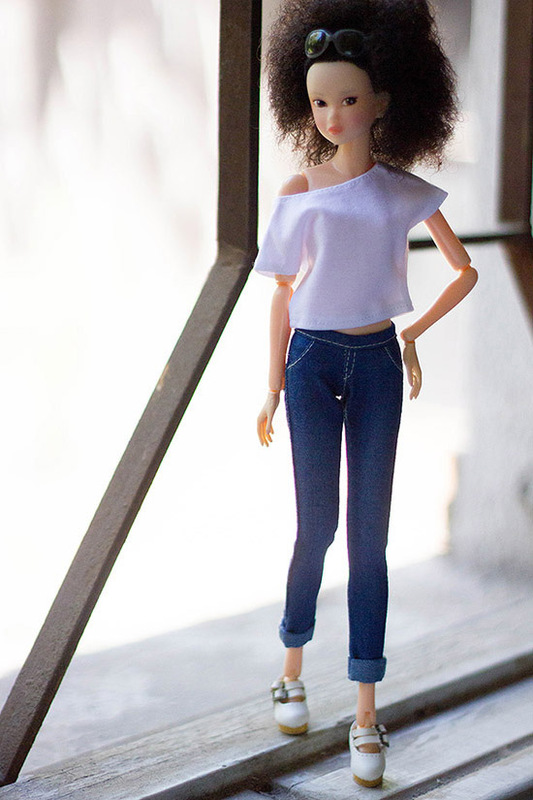 It was hard to get up and actually take the doll out of the closet haha but it was worth it! Oh I love seeing Nina. That outfit looks incredible on her. No wonder she’s a fashion blogger! I really wish I could do this too but I’m just so busy right now. And today is the last day of January!